HEAVY COINAGE: Within two weeks of deposing his cousin Richard II, Henry IV instructed the master of the mint on 14 October 1399 to commence production of coinage. The urgency to resume coin production was driven by both economic and propaganda priorities. Due to the Statute of Purveyors of 1352, which forbade changes to the basis of coinage without the consent of Parliament, the old weight standards remained unchanged for each denomination. But, as in the reign of Richard II the weight of each denomination of silver coinage was too high resulting in a very low quantity of silver being brought to the mint for minting. The lack of farthings in circulation, causing significant suffering for trade in general and the poor specifically, was raised by Parliament in 1402. 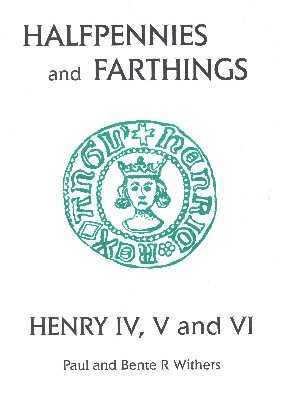 They complained that no farthings had been recently minted, to which the Henry IV replied that in future a third of silver minted would be coined into halfpennies and farthings¹. 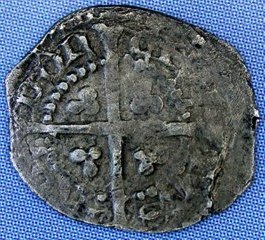 Account records show that only £1,398 was struck into silver coinage between 1400-08, with a mere £6 minted in 1408. Mint accounts from 29 September 1408 until 29 November 1411 are missing, but based on the tiny amount of coinage struck earlier in 1408, it is entirely possible that the mint was closed between these dates². 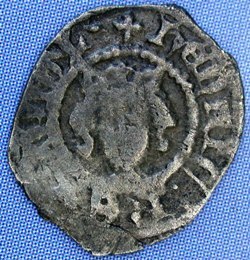 From the evidence available it seems likely that Heavy Coinage farthings were produced sometime between the 1402 when the king ordered farthings to be produced in a response to Parliament's request, and 1408 when the mint most likely closed due to lack of bullion. Farthings of this period are extremely rare due to a combination of low production and the reduction in coin weights in 1412 which resulted in the melting down of the heavy coinage in circulation (the value of the silver in each heavy coin exceeded the face value of the coin). LIGHT COINAGE: The Parliament of November 1411, presided over by the Prince of Wales, decreed a reduction in coin weight to take effect from Easter Day 1412. The result was to make it possible to produce coin at the mint with a small profit for the king. The effect of the new legislation was immediate, with the total weight of silver coined in the first 8 months (until 28 November 1412) being £1,940. This exceed the quantity of all the silver minted in the preceding 12 years. Despite the significant increase in coin production, farthings of this period are extremely rare as Henry I died on 20 March 1413 - only 16 months after the light coinage commenced. Face as Richard II, but crown altered. With evidence of a neck. ¹ Rotuli Parliamentarian, iii, p. 498.